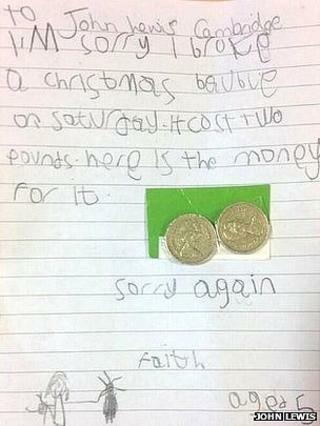 A five-year-old girl sent a handwritten apology to a department store after accidentally breaking a Christmas tree bauble - with two pound coins attached to pay for the damage. Faith wrote to John Lewis in Cambridge after visiting on Saturday. The letter said: "I'm sorry I broke a Christmas bauble... it cost two pounds. Here is the money for it. Sorry again". General manager Dominic Joyce said Faith would be sent a present after the store managed to track her down. He said the girl's mother telephoned after seeing media reports about the letter, but she did not want her identity revealed because she was a "very shy little girl". Mr Joyce said the letter had no address, so staff had been trying since the start of the week to find Faith to thank her in person. "It was just the sweetest letter that was addressed to the John Lewis Christmas Department," he said. "It had a Cambridge postmark and that's all we knew. We think the drawing is of her holding the bauble - it may be a self portrait, but other than that we had nothing else to go on." After the letter was posted on social media, people began a campaign to track down the girl using the hashtag #findfaith.